It is interesting just how much cheaper and powerful notebooks became. Still it is first time I got to play with sub-$500 one and I was most curious what such sum buys nowadays. 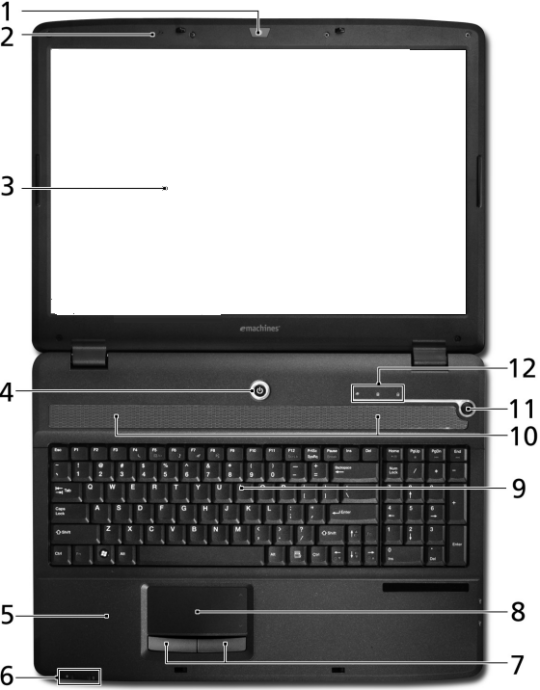 eMachines (brand now belongs to Acer) G520 (part-number LX.N140Y.026) is low-end 17″ notebook. Before some start about Linux, it was excluded because of some Windows-only vector graphics software (isn’t there always some). And you are so not getting virtualization performance on notebook this cheap. Choice of notebook was more for convenience than moving around. So large (cheaper) and heavy (cheaper) model. With Vista Home Basic (cheap). Model looks surprisingly decent. Tidy and uniform black with only some subtle hints at older Gemstone models. Keyboard is large with numpad block and feels hardly different from generic desktop one. The only annoying thing about build quality – battery is loose (not that sane person would use it other than desktop-ed). By the way power brick is one of the smallest I seen (half of my Dell one) and it gets really hot. no modem, no Bluetooth, no FireWire, no Express Card, no HDMI. Naturally low spec machine. Screen is quite pleasant with large physical size and decent resolution. One of worst cases of pre-loaded crap. Not as much from quantity but with choice and low hardware completely unsuitable for that. Notebook came with active Norton Internet Security trial, Google Desktop and some kind of backup utility with multiply system services. Out of the box it was practically unusable from software bloat and poor default settings of Vista. Initial Windows update took almost two hours to complete. After carefully cleaning out all unwanted extras and tuning down Vista’s visuals (Basic doesn’t have fancy glass but composition engine still works and hammers integrated graphics) it turned out to be quite usable. After installing antivirus notebook got noticeably slower again. I had no opportunity to run tests (and I don’t trust them much anyway). As for me it feels that processor is sensitive to multiply tasks running and even two cores don’t help it much at low clock and only 1MB of shared cache. To get (and keep) such notebook in shape some serious attention is needed. There is simply no hardware to compensate for crap that comes pre-installed (or gets installed later by user). At these price and specs notebook is purely work/educational/whatever tool. There is little multimedia potential outside of audio/video and low-end hardware will struggle with a lot of tasks. I think it is probably best to think of it as large form-factor netbook. Still for such a price you get very affordable PC with convenient screen and keyboard. Really interesting, also exist a model with a ATI Radeon 3200 that its way better that Intel GMA4500MHD, and the price is low, I think because this have a AMD chipset instead a Intel. I think the best combo for getting a cheap deal is AMD/nforce chipsets and a nvidia card. AMD processors are great value , and nvidia are the better cards. AMD was for once on top with Athlon64 but when it crashed – it crashed hard. Choice of AMD-based notebooks is very poor around here, even with over-saturated lineups (I read for all brands combined we have like ~2k notebook models on market, it is total mess). I appreciated your review since I don’t know anything about notebooks and am only confused when I paw over them in the stores. I’d like to have a laptop/notebook so I could take what I jokingly call my work with me when I go out of town and not be pining too badly for my lovely desktop. This could work for me. It has all the elements I care about: good, large screen, a keyboard, and whatever else is under the hood that makes it run :) For this, I wouldn’t really care about multimedia. As for pre-loaded crap, I learned from my last couple of computer purchases (believe me there was a long pause between the two) the best solution is to fork over the extra $ for your very own copy of whatever OS you want, wipe the hard drive of your new darling and start over. Cleaning up an OEM OS is a struggle I never want to engage in again. Murder is the best solution. I am not much of notebook expert myself. I own my first (Dell Vostro) for less than a year. :) But I do have plenty passing through my hands for initial setup and occasional fixes/cleanups. I think hardware is at point where pretty much any modern PC (maybe excluding netbooks) can handle office stuff. As result people care less about specs and more about design, mobility and price ratio. So subj has lowest possible price, decent design and usability but ugly heavy. :) It might work well as simple desktop replacement model for work.